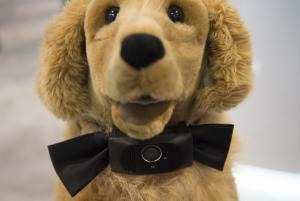 LAS VEGAS, Jan. 8 (UPI) — The International Consumer Electronics Show in Las Vegas went to the dogs with the unveiling of a “smart collar” outfitted with a GPS tracker and a video camera. Motorola unveiled the Scout 5000 smart collar at the trade show and demonstrated how the canine-mounted device includes a GPS tracker, WiFi connectivity and a 720p camera that beams video to the pet owner’s smartphone. The wearable for pets also includes a feature to track exercise and a speaker to allow owners to talk to their pooches through their phones. The company also unveiled the Scout 2500, a smaller version of the smart collar that does away with the video camera to make its size more suitable for smaller dogs. The collar was developed in partnership with app designer Hubble. The Scout 5000 is scheduled to be released in June with a $199 price tag, while the Scout 2500 will be priced at $99.